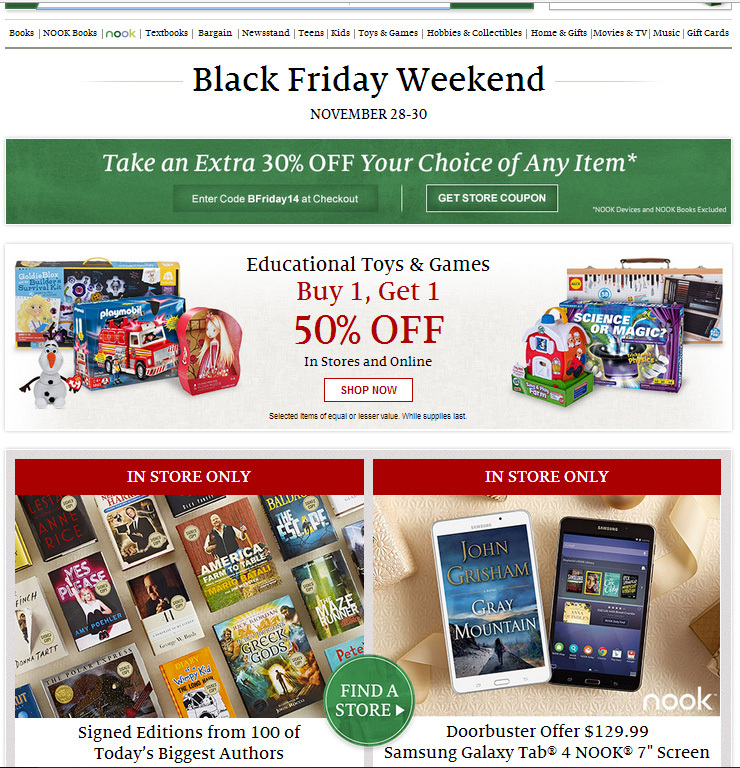 Barnes and Noble has put their Black Friday deals up on their website. They are offering a variety of goodies; some are available online, others are in-store only. The big doorbuster in-store item is the the Nook-branded Samsung Galaxy Tab 7″ for $129.99. There are also signed editions from authors such as E.L. James, Donna Tartt, Neil Gaiman and more. These are labeled while supplies last and you can enter a zip code to find a store near you. Available online, there are a number of 50% off items, including educational toys and games, activity kits, gift books and DVDs. There are also some buy one, get 50% off one items. Barnes and Noble is also offering a 30% off one item coupon which can be used online or printed and used in-store. Nook books and devices are excluded from the offer. The Black Friday weekend sale runs from November 28 to November 30, 2014. This entry was posted in Bargains & Sales and tagged 50% off, Barnes and Noble, Black Friday, gifts, Neil Gaiman, Nook, shopping. Bookmark the permalink.